Weddings Costs > How Much Does a Boutonniere Cost? A boutonniere, usually worn by men, is a floral decoration usually consisting of one flower or a bud. Boutonnieres are usually reserved for special occasions where formal wear is standard such as weddings, funerals or a homecoming dance. A boutonniere made with real flowers will average about $10 to $35. A small boutonniere made with a fresh carnation or daisy will be about $5 to $10, one made with a medium-sized fresh rose will be around $10, and a boutonniere made from a fresh lily or Gerbera daisy will be about $15 to $20. Silk boutonnieres are about the same cost. The only difference is that a fresh boutonniere will not last forever, but a silk boutonniere can. However, a silk boutonniere will not look as realistic. Some people choose to have a fresh boutonniere made for the wedding day and then purchase a silk replica that they can keep. According to multiple members on this WeddingBee.com forum thread, they had spent anywhere from as little as $4 for a DIY to $18+ at a local florist. The actual boutonniere will be decorated with ribbon, ivy, and fillers, such as baby’s breath, according to the color of your wedding. Other boutonnieres will not have any decorations such as ribbon. Make sure you make your wishes clear when ordering from a florist. Boutonnieres will come with a pin used to attach it to the men’s jackets. However, depending on the weight of the boutonniere, you may need a second pin to keep it from falling off. A boutonniere will be worn through the lapel buttonhole and will be kept in place with the loop on the back of the lapel. The boutonnieres will be sent in a plastic container that can be used for temporary storage. Most can be purchased online, via a local florist, through a wedding planner or bridal boutiques. If you order your boutonnieres online, you will be charged for shipping. If you order fresh flowers online, they will need to be shipped overnight, which can be quite costly on larger orders. If you order your boutonniere at the last minute, there may be an additional expedited charge. Try to purchase flowers that are in season. Flowers that are out of season are going to cost more since the florist will have to order from places that are outside of the area. Pick up flowers on the day of the wedding. If flowers are picked up before the wedding, the heat can cause damage to the flowers causing them to wilt. 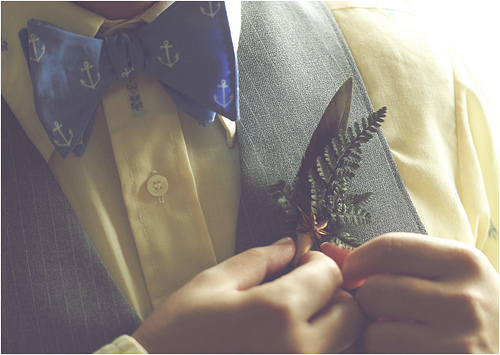 Before an order is placed, be sure to write down all the names that will receive a boutonniere. There are times when a bride will place an order, only to find down the road that someone was left out of the purchase. If purchasing the flowers for an event such as a prom, try to get a set that matches the dress or suit. Keep the flower refrigerated until you’re able to put it on. This will help keep the flower looking lively. When ordering multiple boutonnieres for a wedding, most florists offer the groom’s boutonniere for free with a purchase of a minimum number of total boutonnieres. Ask your florist for more information. Be sure to talk with the florist about bulk orders. Many florists are more than happy to work with those that place bulk orders. It is possible to make your own boutonnieres using a few simple instructions. Try to purchase flowers in season since off-season flowers may be double or even triple the cost. If using a local florist, it is best to use one that has been referred to you by someone you trust. Leaving something this important up to a company without a good reputation may cause a bit of stress on the wedding day.